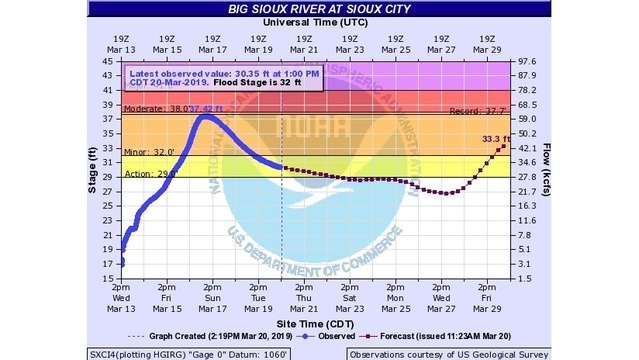 March 20, 2019 - KCAU 9 is continuing to monitor the potential for Major Flood Stages to be reached once again next week with the biggest concerns lying along the Big Sioux River Basin. 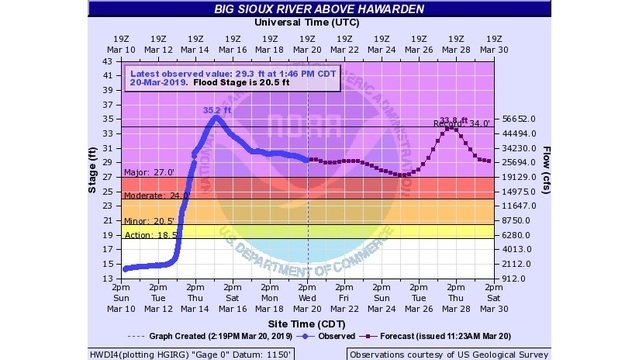 This second spike in flooding is mainly due to melting snow in the Dakotas and Minnesota which will send another wave of water downstream toward Siouxland. 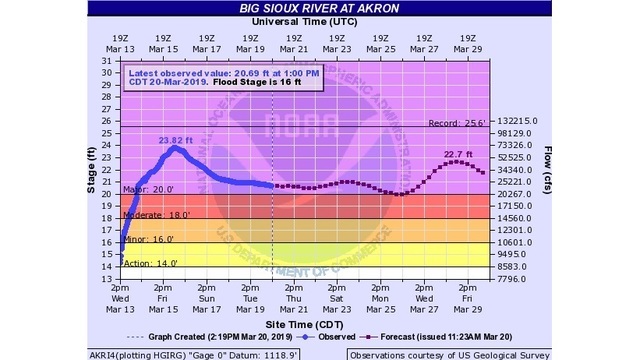 Initial forecasts from the National Weather Service lifted water levels above what was witnessed along the Big Sioux River last week when some of the highest crests ever recorded were measured in Akron, Hawarden, and Sioux City. The newest information shows that while Major Flood Stages will still likely be hit in Hawarden and Akron, the situation may not be quite as severe as first thought. The river flooding crests have been dialed down for two primary reasons. Rainfall this weekend is coming in on the lower end of expectations with about a tenth to a quarter of an inch of precipitation. Also, temperatures will be slightly cooler than earlier forecasts. Highs in Siouxland will be in the mid to upper 50s. All of the moisture related to melting snow is going to create periods of dense fog - especially north of Sioux Falls - and that fog is going to limit maximum temperatures and resultant melting of the heavy snow pack to our north. Be prepared and stay with KCAU 9 as we evaluate the flooding potential and bring you updates on-air plus through Facebook, Twitter, and SiouxlandProud.com.